See Weian Zhao present his work at our EmTech conference. There are surprisingly few ways to directly observe how cells and proteins work inside living creatures. 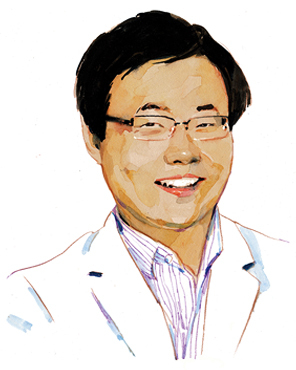 Weian Zhao devised simple sensors that let scientists do exactly that. Zhao starts by identifying a short, single-stranded piece of DNA called an aptamer that selectively binds with a protein or other biomolecule researchers are interested in. He attaches a fluorescent dye to the aptamer and then attaches the aptamer-dye combination to the surface of a type of stem cell, found in bone marrow and fat tissue, that homes in on inflamed tissue and tumors. When the combination of dye, aptamer, and stem cell is injected into a living organism, the stem cell seeks out the targeted biomolecules. For example, if researchers want to look at unhealthy tissue, the aptamer latches onto the biomolecule suspected of being at the root of the problem, and the dye lights up or changes color. By putting mice that have been injected with these sensors under a special microscope designed to hold a living animal and spot fluorescent dye, Zhao can see where in the organism the dye ends up. He can observe the action down to the level of individual cells, and he can even watch in real time how the biomolecular traffic is altered by the presence of drugs or by other changes in the organism. That’s never before been possible. Zhao’s lab is working on a way to rapidly create vast libraries of aptamers that bind to almost any molecule. He foresees scientists using these libraries to build a collection of cellular sensors not only for use in basic research but also to improve the drug discovery process. At present, drug discovery suffers because what happens in cell cultures rarely duplicates what happens in living animals, sometimes misleading researchers and wasting time. Zhao’s sensor will allow scientists instead to immediately observe what the drug does inside animals, which can help speed a promising drug toward human trials. Zhao is also currently working toward getting his stem-cell-based sensors to bind to various cancer markers found in whole blood, in the hope of developing a faster, less expensive, and potentially more accurate diagnostic tool that could even in many cases eliminate the need for a biopsy. He figures that if the work pans out, some of these tests could be on the market within as little as five years.